In over 40 countries, smart leaders are hiring and training better employees using TalentClick's leading risk-based personality assessments. Safety Quotient. Predict your next incident. Safety Quotient™ (SQ™) is a personality assessment which helps reduce incidents caused by unsafe behavior. Our SQ™ questionnaire assesses job-relevant personality dimensions which provides a ”read” on personality risk-factors in safety sensitive settings such as mining, construction, manufacturing, oil and gas, transportation, etc. SQ™ provides workers with Safety Self-Awareness and a better understanding of their “default” personality. The goal of SQ™ is to empower workers to modify behaviors and manage reactions & impulses to ensure that everyone is safe on the job. It’s not about blame (there are no right or wrong personalities), but about safe and unsafe behaviors. Employers use SQ™ to help identify workers that are more likely to cause incidents in the workplace. Employing a worker with unsafe tendencies on your team can be very costly. For existing employees, being aware of your worker’s personality risk-areas is important in mitigating the potential risks they can pose to themselves, others on their team, and the organization. Workers with high impulsive scores had an incident rate 5 times higher than those with low and average scores. Foremen with high resistant scores had an average incident rate 2.3 times higher than those with low and average scores. Foremen with high irritable scores had an average incident rate 4 times higher than those with low scores. Job Applicants: Gain insight into the type of worker a candidate will be and the possible risks associated with hiring that person. Existing Staff: Assess current staff to identify training needs, gain management tips, and develop self-coaching strategies. Driver Safety Quotient™ is a personality and behavioral assessment designed for adults who drive as part of their occupation. The assessment helps identify patterns of behavior and can be used to implement solutions for maximizing individuals’ strengths and minimizing their safety risks while on the road or in the workplace. DSQ™ is used in a wide range of settings including business, education, training and coaching and it is intended for workers who drive motor vehicles (short or long haul) or operate heavy equipment machinery (cranes, forklifts, dozers, excavators, etc.) as part of their occupation. Employers use DSQ™ to help identify drivers and operators who are more likely to cause incidents and injuries and violate rules. The cost of owning a truck today means the wheels have to be kept turning to keep up with repayments and to fulfill contract arrangements. Employing a new driver can be very costly should you employ an unsuitable driver on your team. For existing employees, being aware of driver safety risk areas is important in mitigating the potential risks they can pose to themselves, others on the road, and the organization – it is your company name written on the truck after all. Drivers and Operators with high Resistant scores received on average 4.6 times more traffic tickets than those with low scores. Drivers and Operators with high Irritable scores had an average incident rate 2.6 times higher than those with low scores. Drivers and Operators with high Distractible scores had on average 139% more At-Fault Accidents than those with low scores. Job Applicants: Gain insight into the type of driver/operator a candidate will be and the possible risks associated with hiring that person. 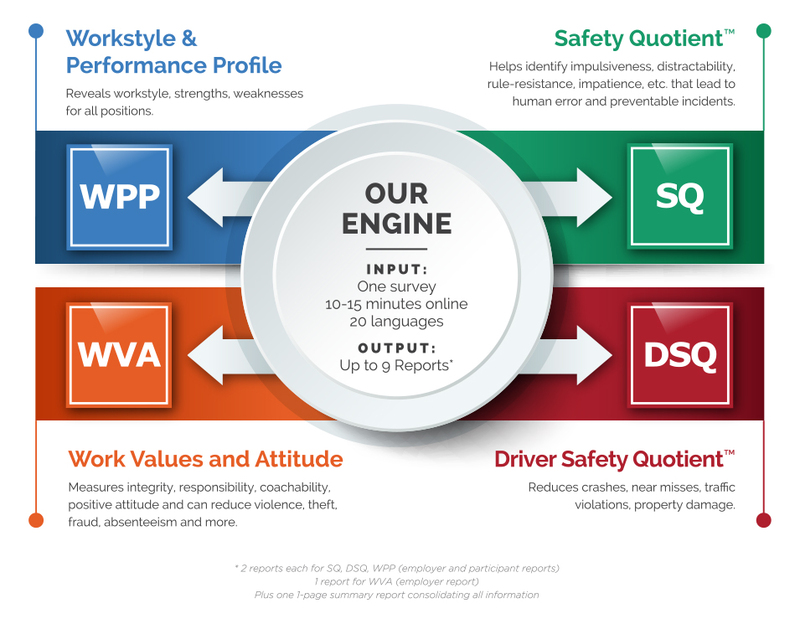 Workstyle & Performance Profile (WPP) is a personality assessment used by managers to improve the quality and efficiency of the hiring process while decreasing costs of turnover and low morale by uncovering the unique workstyles of current and prospective employees. WPP helps employers and managers understand how people will “fit” to roles by providing a preview of an individual’s natural workstyle and default settings. The reports provide insights that lead to increases in positive outcomes such as retention, productivity and engagement and decreases in negative outcomes such as turnover, management challenges, and poor organizational and culture fit. The WVA reports offer insight that helps organizations decrease negative outcomes such as employee absenteeism, turnover, theft, fraud and violence, AND increase positive outcomes such as teamwork, employee engagement, productivity, customer satisfaction, profitability, and more. The WVA helps employers and managers understand how people will “fit” to roles and corporate values and attitudes by providing a preview of an individual’s natural workstyle and default settings. The reports provide insights that lead to increases in positive outcomes such as retention, productivity and engagement, and decreases in negative outcomes such as turnover, management challenges, and poor organizational and culture fit.